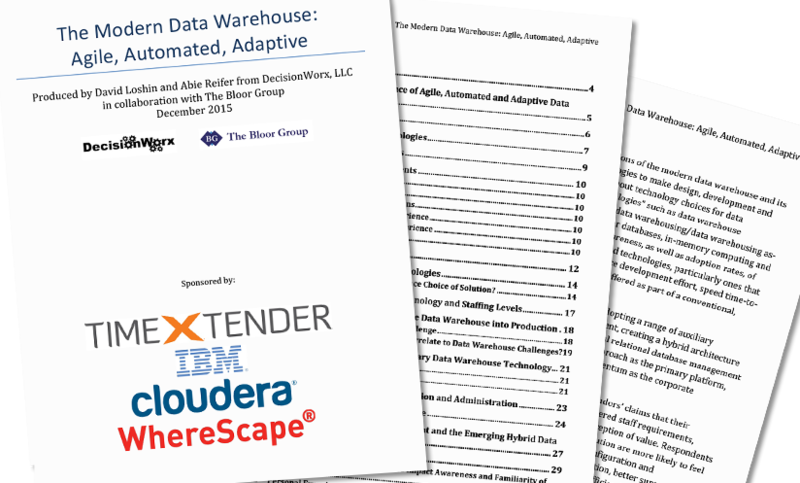 This research study seeks to understand perceptions of the modern data warehouse and its incorporation of adaptive and automated technologies to make design, development and operations more agile. Respondents were asked about technology choices for data warehousing, including what we term “agile technologies” such as data warehouse automation, cloud-based data warehousing, hosted data warehousing/data warehousing asa-service as well as newer technologies like columnar databases, in-memory computing and Hadoop. The results communicate insights about awareness, as well as adoption rates, of those newer, more agile data warehouse platforms and technologies, particularly ones that are promoted within the vendor communities to reduce development effort, speed time-tovalue or provide capabilities beyond what is typically offered as part of a conventional, RDBMS-based data warehouse deployment.